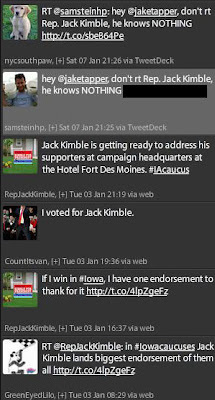 Throughout his campaign, Jack Kimble has faced an uphill battle just getting his message out. In Iowa, they miscounted his votes, some media outlets have refused to count him as a major presidential candidate, and he was only invited to 4 of the many primary debates this year. Many of his supporters had begun to openly question whether there was some kind of conspiracy to quiet Jack Kimble's voice. The answer has now become clear thanks to a Twitter post from Huffington Post's Sam Stein (If that is his real name) to ABC's Jake Tapper. Luckily for the American people, Mr. Stein forgot the cardinal rule of the internet and the smoking gun remains on Twitter. It was actually Jack Kimble himself who found the hurtful tweet while participating via Twitter in last night's New Hampshire debate. At one point Jake Tapper retweeted a comment that the Congressman made about the absurdly high tax rate that American businesses are paying. In the picture to the left, you can see Mr. Stein's tweet. I have taken the liberty of blacking out the link he made to a hateful Washington Post piece on Congressman Kimble. Evidence of a corporate media blackout on Kimble, gives pause to any American who is thinking of voting for another candidate. If the lamestream media is actively pushing Mitt Romney and other candidates, why are they so supportive of Congressman Kimble? Is is because he is the only Republican candidate with a legitimate shot to defeat Barrack Obama in November?